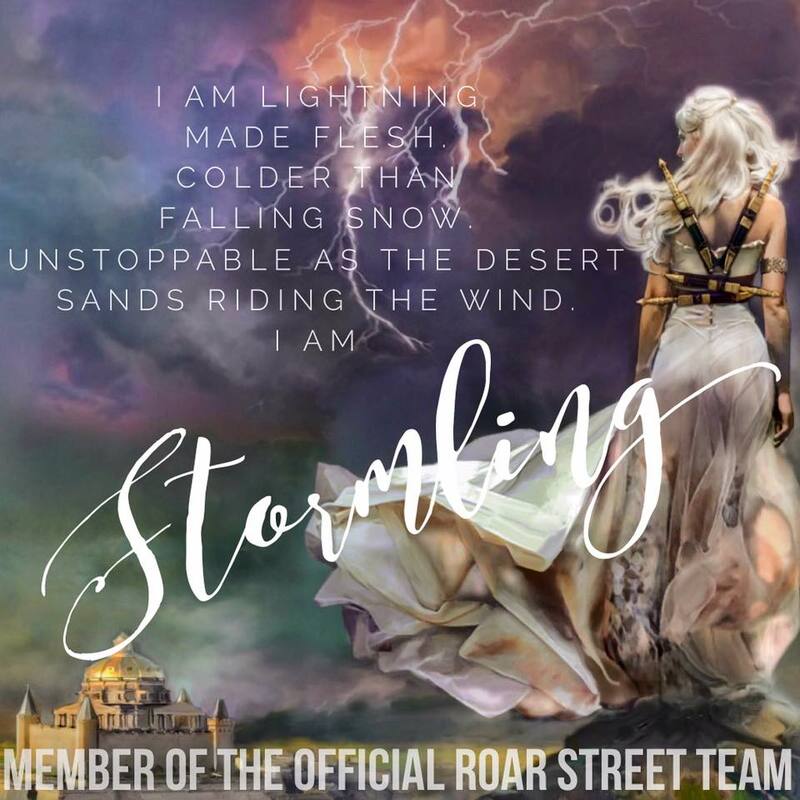 About ROAR (Stormheart #1):New York Times bestselling author Cora Carmack's young adult debut: Roar. In a land ruled and shaped by violent magical storms, power lies with those who control them.Aurora Pavan comes from one of the oldest Stormling families in existence. Long ago, the ungifted pledged fealty and service to her family in exchange for safe haven, and a kingdom was carved out from the wildlands and sustained by magic capable of repelling the world’s deadliest foes. As the sole heir of Pavan, Aurora's been groomed to be the perfect queen. She’s intelligent and brave and honorable. But she’s yet to show any trace of the magic she’ll need to protect her people. “This life is not glamorous,” Duke told her. “We travel constantly. We sleep on the ground most nights. When we’re not in danger from storms, we’re in danger in cities where we are considered criminals. This life is not for the faint of heart.” “There are things I do not know, things I will have to learn. But I am capable. I am familiar with sacrifice. I know what it is to make hard choices.” “Tell me you’re not considering this,” Locke said to Duke. The old man was silent for a long moment, both Locke and Roar looking to him for support. Duke rubbed at his mustache, a habit of his when he was thinking deeply. “Let’s think about this, Locke. She’s smart. And determined.” “She’s a child.” Roar’s shoulders hunched in Locke’s peripheral vision, and he swallowed back the guilt. He could apologize later. For now, it was imperative that he won this argument. “You were a child when I brought you into the fold,” Duke said. “She’s a young woman with a good head on her shoulders. And if this is what she wants, I’m inclined to at least hear her out.” Just like that, Roar’s shoulders straightened, and Locke turned to watch a devastating smile bloom across her mouth. His weakness when it came to her only made him more cross. “What skills do you have?” he snapped at Roar. “Skills?” “Yes, skills. What can you do? Or do you just plan to tag along for the ride?” A flush spread over her cheeks, and her voice was tentative when she answered, “I’m good on a horse. Very good.” Where in the world would she have learned to ride? He quickly hardened his expression. “Horses are fine for travel, but they don’t do well in storms. They, unlike you, have good survival instincts.” As soon as the words were out of his mouth, Locke could have sworn he felt an updraft—the first sign that bad weather could occur—and he knew that this time he had pushed too far. Roar marched toward him, spearing a finger into his chest and said, “I can read and write. I can speak Taraanese, Finlaghi, and Odilarian. I can read maps. I know enough about grassland vegetation and wildlife to survive without a market to buy food and drink. I’m good with knives and a bow. I learn quickly, and I’m not afraid of hard work. And I’ve spent my entire life reading as much about storms as I could get my hands on.” For a moment, her voice cracked under the weight of her anger, but she took a huffing breath and continued: “I’m good with numbers. It’s been a while, but I think I can probably still draw the constellations from memory, which should make me decent at navigation. I can—“ “Enough.” Locke’s voice came out in a deep rasp. He captured her long, delicate finger in his fist before she could continue poking him. He felt short of breath at the sight of her—livid and lovely. “Enough.” The old Locke might have kept arguing, and Roar would have met him toe-to-toe. But if becoming a storm hunter had taught him anything, it was that fighting head-on wasn’t always the way to win. Sometimes strategy was required. He met Duke’s eyes over her shoulder, and if he had thought Roar looked smug before, she had nothing on his mentor. The man raised his eyebrows in a challenge and asked, “You?” He hated the idea of bringing someone into this dangerous life, but if it was going to happen regardless, he sure as hell wouldn’t hand her safety over to anyone else, not even Ransom. And at the very least, it would give him the opportunity to change her mind. He gritted his teeth and nodded his acceptance.